Students at Codington Elementary School are making some new friends — in places like Turkey and Brazil. The school is part of a newly launched worldwide leadership project called “Building a More Peaceful World, One Classroom at a Time.” The program was created by Codington Elementary Principal Budd Dingwall and John Jay Bonstingl, author of school leadership book, Schools of Quality. The goal of the program is to help students learn how to work and communicate with people that might look, sound and think differently from them, according to a release from New Hanover County Schools. Codington Elementary is the first American school to participate in the program. Codington Elementary students “met” and interviewed their international counterparts this week through Skype, a computer program that uses a webcam and microphone to let two people communicate. They spoke to students from Istanbul, Turkey and Limeira, Brazil. The leadership project will continue with more interviews with other students around the world. Wilmington Star-News, Wilmington, NC. Published: March 8, 2013. Used with permission. Students at Chester’s Stetser Elementary School, last Wednesday, took their families and friends back in time to the Civil War-era as they hosted an Emancipation Proclamation celebration to commemorate the 150th anniversary of that historic document dressed in period costumes and acting like wax museum figures. “The meat of tonight is going to be the research they’ve done. (Students are) dressed in character so people will go around, press a button and then the students will come to life,” explained Janet Baldwin, Stetser’s principal. Fifth graders presented their research about the 1863 document, slavery and the Civil War with brief skits, poetry and the “wax museum,” dressed as various historic characters from that era. Community participants toured the gym and could go up to each student in character and push a button next to the historic figure. Once pushed, the student would “come to life” to tell their historic figure’s story as if they were the character themselves. “My given name is Isabella Baumfree. I was born into slavery in 1797. I was sold at an auction. All together, I was sold four times. I am Sojourner Truth,” said Mia Grobes, a fifth grader who had done an impressive job of memorizing her character’s full profile, word-for-word. “I like that she had the courage to stand up for herself and go to court and win that case to get her freedom,” continued Grobes. 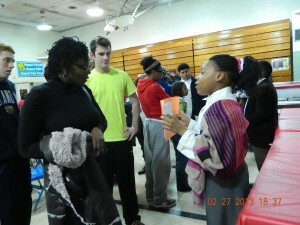 A $5,000 grant from the National Association of Elementary School Principals (NAESP) funded the project. The Exploring our Global Community grant will also allow fifth grade students to share what they have learned about the Civil War over the internet with students in South Africa via Skype, who will, in turn, share about their own investigation into Apartheid. 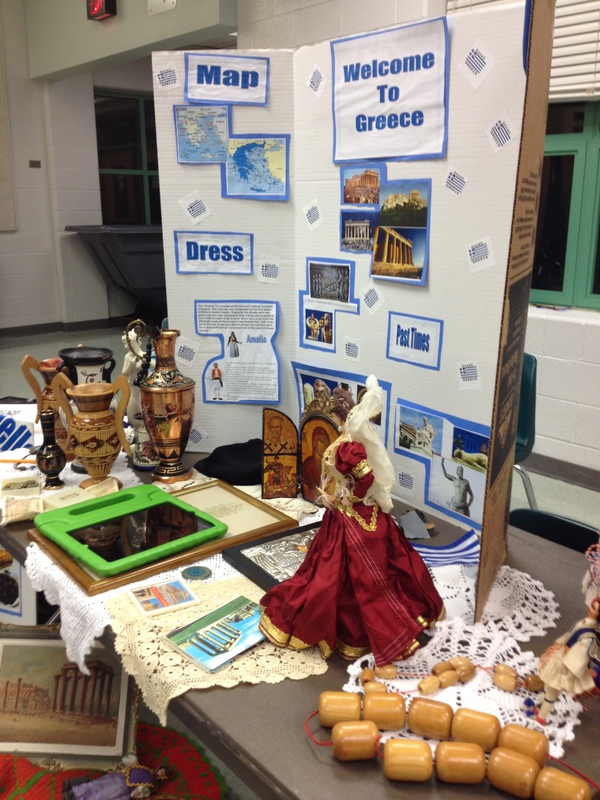 The unifying theme of this collaboration is called Quest for Freedom and students will benefit by learning about another country’s history, as well as their own. Stetser was one of only 25 schools selected for this grant. Tyra Quail, a retired reading teacher, was hired to help teachers fully integrate the use of the internet and webcam into the school lessons. Quail said children were greatly intrigued by the Underground Railroad so they studied even further at the students’ request. Chester Spirit, Chester, PA. Published: March 6, 2013. Used with permission. Samuel Hoffman/The Journal Gazette, Fort Wayne, Ind. 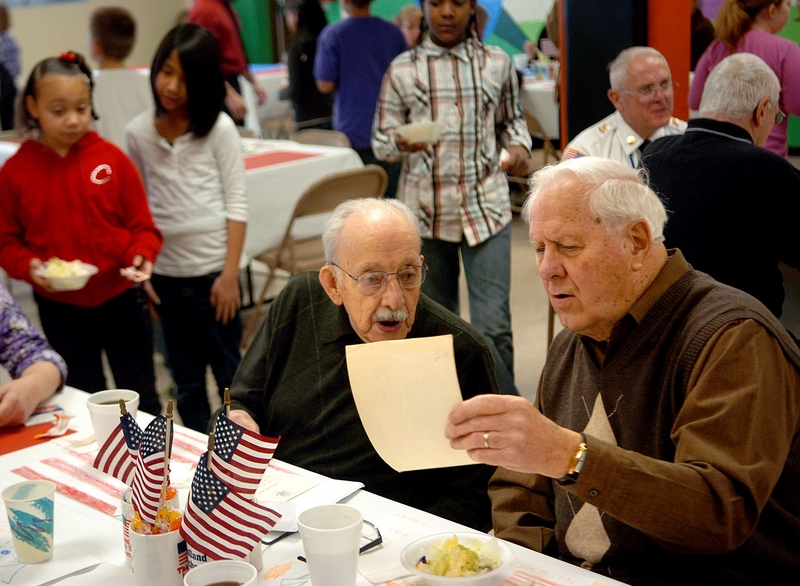 : Navy veterans Ed Schulz, left, and Raymond Moyer look at old photos at Holland Elementary. Area veterans were guests of honor at a school luncheon. Sarah Janssen | The Journal Gazette, Fort Wayne, Ind. About 40 military veterans and some of their family members sat at tables covered in tablecloths and hand-decorated placemats at Holland Elementary while students wandered the room, tending to their guests, offering coffee and drink refills and serving food. The luncheon Friday was made possible through a $5,000 grant the school received from the National Association of Elementary School Principals and MetLife Foundation. Holland Principal Michael Caywood was among 25 elementary and middle school principals to receive the award. Caywood said the grant’s goals are to create schools that are more globally oriented and engage students in service-learning projects that provide the opportunity to learn about other countries and cultures. The school plans to use the grant money for other events and projects that also align with the goals. After the luncheon, veterans took photos, letters and other artifacts around to classrooms to share stories about the places they’ve traveled to and the people they met through their military experiences, Caywood said. The school has also been in contact with the commanding officer of a military unit stationed in Kuwait. Caywood said the school plans to have students write letters to soldiers and chat with them live through video conferencing. “It’s just another way of helping our kids learn about the areas where our military is serving,” Caywood said. The Journal Gazette, Fort Wayne, Ind. Published: January 21, 2013. Used with permission.